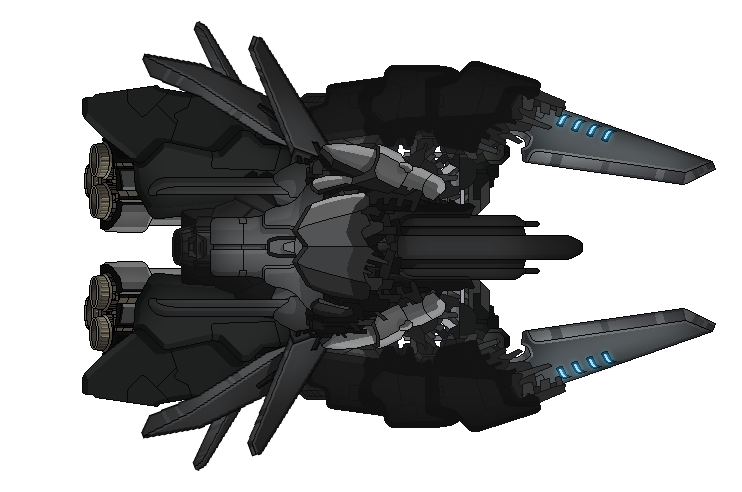 A ship that the Lanius cobbled together out of leftover scraps. Mission Summary: Deliver top-secret data to the Federation base and cripple the Rebel fleet. All Lanius are inherently aggressive people*, indiscriminately seeking out sources of scrap metal. Most are content to consume it, drifting from place to place in their oddly-shaped ships; some take pride in their metalwork, repairing ships and making weapons from piecemeal scraps. But only one can turn the pieces of charred shipwrecks back into working ships: Magnus the Mad. He followed the war's remnants to our station, fusing ship scraps together as he traveled--when he arrived, he didn't come in a typical Lanius bomber or scout; he came in a bizarre cross between a Rock and a Slug scout. He looked at our junk heap (all the ships that failed Codename Phoenix), and damn near exploded with rage, swearing at us and spitting curses in his native Lanian. And although we couldn't translate, we could hear the sheer hatred in his voice. Then he punched out our guards, and attached the spare parts to his cruiser before our reinforcements arrived--and when they did, he lent his cruiser's services to the Federation. Ordinarily, we wouldn't let such a violent person take an Alpha-priority mission. For assaulting Federation staff, we'd have him arrested and probably jailed--and someone with the title of "the Mad" is never really good news. The Lanius gave that title to him when they saw just how far he would go for his “art”: he cloned himself, and killed each of his clones to harvest their metal. Of course, these aren’t ordinary times. We’re down a lot of ships, and he was willing to volunteer…and besides, he’ll kill just about anyone for his art, Rebels included. Yep, a ship made entirely out of the gibs of other ships. See if you can spot them all! The Burst Flak gun is a custom weapon that Magnus personally made--to him, metal is the finest of all matter, and his custom gun is ceremonially important as well as powerful. In human terms, it's kind of like using a gilded sword--showing class superiority while also showing battle prowess. It fires four shots per volley: 1 medium debris piece, another medium debris piece, a large debris piece, and a clump of debris, dealing up to six damage (1 damage per piece, the clump is made of 3 pieces). 18 second cooldown, 4 power. Starts with 1 Lanius, 1 Human, and 1 Rockman. Art Attribution: The description says it's gibs from FTL...credit should be fairly obvious. 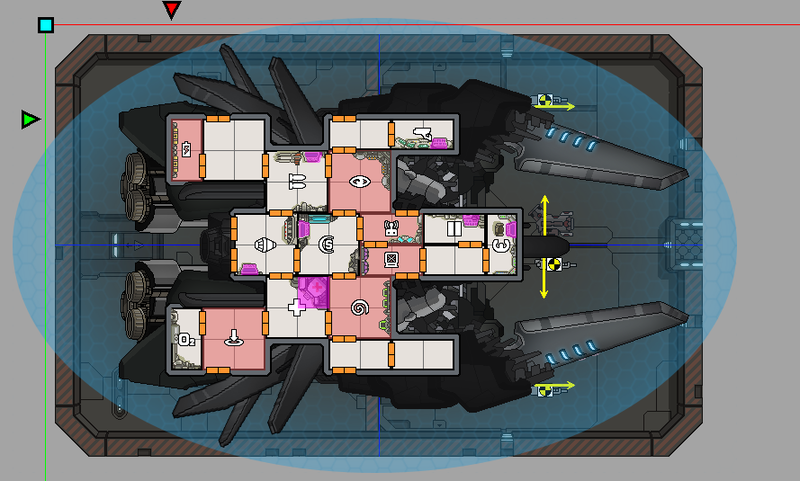 But nonetheless: creators of FTL own the original resources, from which I've recolored/pasted together something new. Last edited by NarnKar on Sun Aug 03, 2014 4:58 am, edited 3 times in total. the ship is a looker if a bit too black. I think you made it like this so it does not look too cobbled togheter. maybe some "mad" stripes? The custom weapon is great, but it does need another support weapon to get more out of it. If I have a criticism it is in the gibs, they fly out rather quick upon explosion, maybe slow them down a bit? also with the lore you have the Lanius asks to be renamed. all in all with the short test I gave it, it is a nice ship. And AE is hurting for nice ships lately. el Rago wrote: the ship is a looker if a bit too black. I think you made it like this so it does not look too cobbled togheter. el Rago wrote: maybe some "mad" stripes? In the next version, maybe. I've made a different ship out of some of the same gibs, some different ones. el Rago wrote: If I have a criticism it is in the gibs, they fly out rather quick upon explosion, maybe slow them down a bit? Duly considered. Although the thing is really just held-together gibs, so it makes sense for them to fly apart quickly. But duly considered, anyway. Yeah, yeah. I suppose so. I'm not that great a writer...although most of my Lanius come to me with the names "Elnubnub" or "Translator". Hah, what even IS a Lanian name? EDIT: either that, or you mean to say "the lanius spawned in the ship is not the lanius in the lore"--I haven't gotten into event-writing yet. I'll look into it. el Rago wrote: all in all with the short test I gave it, it is a nice ship. And AE is hurting for nice ships lately. Regardless of my protests with the lore, this is quite a nice ship, and it has a fairly interesting layout. I'll see about playing it, but for now, I'm busy with my own ship. yeah, I admit I kinda messed up the lore behind the ship. Like, most of the background on the Lanius, really. Do you mind if I use the hull in a personal project of mine? I could give you credit for it. Why are you asking everyone this? Why are you bumping old topics to ask this? Why aren't you visiting the Shipyard? And to answer your question: maybe, but it depends on what the project is. I have been visiting the shipyard. In fact, I have a whole collection of ship hulls from there. I've even created a few ships that I'm planning on posting here when I finish some minor things. But I stumbled upon a couple other ships that were created by other people, and I'm asking for permission to reuse them. Well okay cool, but what's your project?